US real GDP growth for the second quarter of 2018 was confirmed at an annual rate of 4.2%. And that means US real GDP is 2.9% higher than one year ago. The ‘annualised’ rate was the highest since the third quarter of 2014. Similarly the year on year rate is the highest since 2014. But not the highest rate in history – as President Trump claims! But it does show a relative recovery from the near recession rates of 2016. But as I have mentioned before in previous posts, the underlying story is not so sanguine. First, the 4% ‘annualised’ growth rate is really dependent on some one-off factors that will soon turn into their opposites. 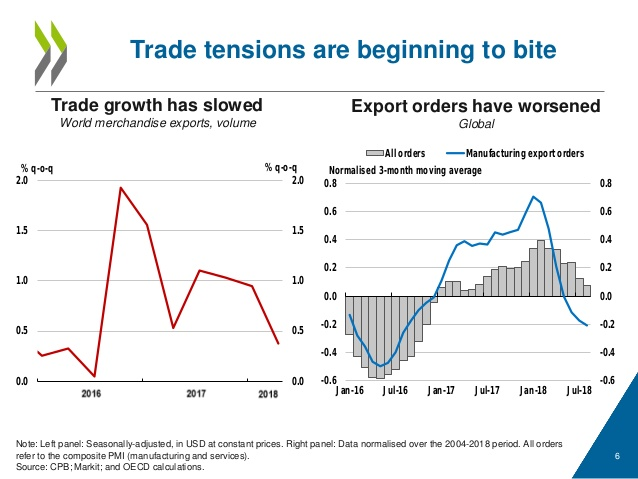 US net exports was a big factor in the 4% rate and this was mainly due to the rush by China to buy up American soybeans before tariffs on US exports took effect in retaliation to Trump’s trade war with China. Second, growth has been jacked up by Trump’s huge tax cuts for corporations on their profits. While pre-tax profits for the major corporations have risen a little, it is post-tax profits where there has been a bonanza. According to a recent report by Zion Research, for the top 500 US companies, 49% of their 2018 profits were due to the Trump tax cuts. For some sectors, like the telephone companies, it was 152% of 2018 profits ie from loss to profit. Nevertheless, mainstream economics seems generally convinced that the US is out of its Long Depression of the last ten years and is now motoring ‘normally’. The official unemployment rate is at all-time lows, wages are beginning to rise a little and inflation has ticked up marginally. So the US Federal Reserve decided to push up its policy interest rate for the eighth time since 2015 to reach 2.25%. The rate is used to set credit card, mortgage and loan rates and will trigger rises across the board for consumers and businesses. In a statement the Fed signalled more rate hikes were imminent. “The committee expects that further gradual increases in the target range for the federal funds rate will be consistent with sustained expansion of economic activity, strong labor market conditions, and inflation near the Committee’s symmetric 2% objective over the medium term. Risks to the economic outlook appear roughly balanced,” So the Fed seeks to ‘normalise’ rates in line with the ‘normal’ growth of the US economy and reckons its economic forecasts are about right. But as I pointed out in a previous post, if the Fed is wrong and the productive sectors of the US economy do not resume ‘normal growth’ (the average real GDP growth rate since 1945 has been 3.3% – so growth is not back there yet), the rising costs of servicing corporate and consumer debt could lead to a new downturn. 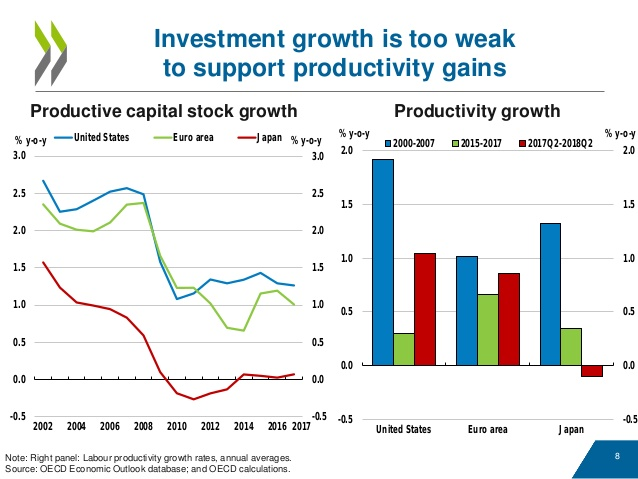 The key factor for growth is investment by the capitalist sector. And what decides the level of that investment in the last analysis is not the level or cost of debt but the profitability of any investment. 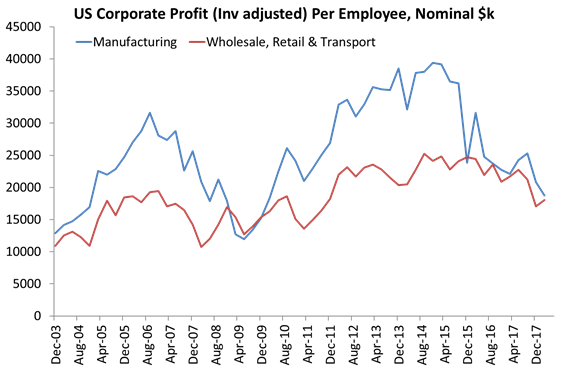 Business investment has made a modest recovery in the last few quarters, driven by the 16% rise in corporate profits after tax. But the bulk of this profits bonanza for US corporates in 2018 has been used to pay higher dividends to shareholders and buying back company shares to boost the share price, not in productive investment. And within productive investment, most has gone into the oil industry and into ‘intellectual property’ (software etc). Investment in equipment and new structures in other businesses has been very modest. Moreover, non-financial corporate profits are still below levels of 2014, even after Trump’s boost. And in the productive sectors of the economy, like manufacturing, they are falling quite sharply – as measured per employee. At the other end of the economy, average incomes for American families are making little progress. In an excellent post, Jack Rasmus of the American Green Party showed that for non-supervisory workers (non-managers) who are the bulk of the American workforce (133m out of 162m), real incomes are falling not rising, while the burden of consumer debt is rising. When Trump announced his corporate tax cuts, he claimed that this would allow companies to increase wages from their increased profits. This, of course, has turned out to be nonsense. There has been very little increase in private sector wage compensation since the end of 2017. And it is only in the US that we can talk about ‘recovery’ or ‘normal’ growth. Everywhere else hopes of a return to pre-crisis growth rates seem dashed. In the Eurozone, growth has slipped back to around 2% a year, still one-third below pre-crisis rates. In Japan, it’s back at 1%. China too is ‘struggling’ to stay above 6% a year. So “It is urgent for countries to end the slide towards further protectionism, reinforce the global rules‑based international trade system and boost international dialogue, which will provide business with the confidence to invest,”. And as for the so-called emerging markets, the situation continues to deteriorate. 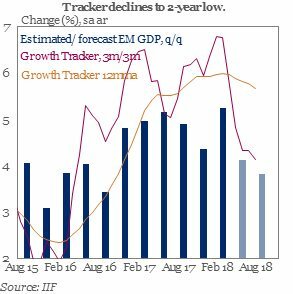 According to the IIF, growth tracker, emerging market growth is now at a two-year low. 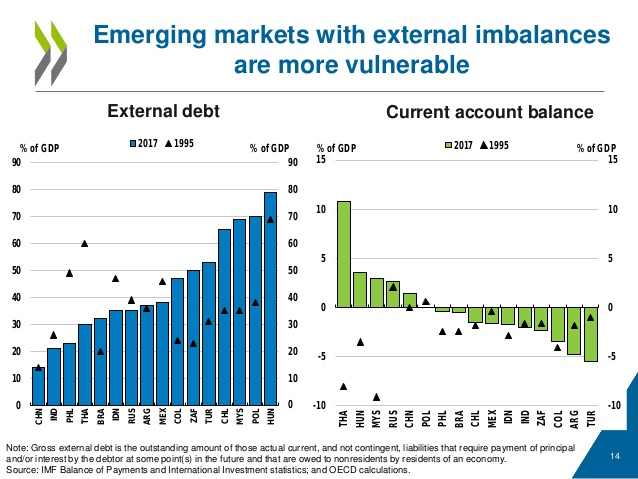 And as interest rates globally rise (driven by the Fed) and trade wars begin to squeeze global trade, emerging markets with high corporate debt are especially vulnerable. The right-wing government of Argentina has now had to swallow a record-breaking IMF bailout of $57bn. IMF chief Lagarde said that, as part of the deal, Argentina’s central bank can only intervene to stabilize its currency if the peso depreciates below 44 pesos to the dollar. It is currently at 39 pesos to the dollar after losing 50% of its value since the start of the year. The president of Argentina’s central bank, Nicolás Caputo, resigned because of this condition. The size of the bailout shows how desperate the IMF is to support the right-wing government in Argentina, but also to remove any independent action by the Argentine monetary and fiscal authorities. Argentina’s economic policy is now being run by the IMF. Argentina is now under the grip of IMF dictates, something the right-wing Macri government said would never happen again. A massive slump and austerity will now follow for the Argentine people – repeating the hell of the last major slump of 2001. At the same time, the Turkish economy is in meltdown. There the Erdogan government refuses to take IMF money in return for austerity and control over its currency and interest rate policy – unlike Argentina. But it will make no difference: both countries cannot avoid a serious slump as interest rates spiral and inflation rockets. There is one economic lesson to be learned here. When Greece was locked in the straitjacket of the so-called Troika (the IMF, the ECB and the Euro group), many Keynesians and radicals said that the reason Greece was in this mess was that it was inside the Eurozone and so it could not devalue its currency or control its interest rates. If it broke away, it could control its own destiny. Well, Argentina and Turkey now show that it was not the Eurozone as such that was the problem, but the forces of global capitalism. Both Argentina and Turkey control their currency and interest rate policy. The former has opted for IMF control and the latter refuses it. But it will make no difference – the working people in both countries will pay the price for the crisis in their economies. This entry was posted on September 28, 2018 at 7:33 am and is filed under capitalism, economics, Profitability. You can follow any responses to this entry through the RSS 2.0 feed. You can leave a response, or trackback from your own site. What is your real opinion on this important issue? I appreciate your comments. You raise a very important issue – the manipulation of statistics. Even raw data are open to question, depending on how they have been collected by the organisation involved. And of course, scientists, not just economists, can ‘manipulate’the raw data, maybe to draw out the trends involved clearly, or as you say, to ‘bias’ the data to show what the economist wants to argue for. Take the case of measuring the rate of profit. There are different sets of data that can be analysed. So assumptions are made from the start about which data are relevant. Then various statistical analysis can be applied that could and do produce different results. Finally, there is ‘interpretation’, which means that analysts can conclude different things from the same results! In the case of the rate of profit measures, I always feel more confident about the conclusions when different sets of data, using different statistical techniques lead to broadly the same conclusion. In the case of the US rate of profit, namely that the US ROP fell secularly from 1945-2018;that it fell most from 1964-82; that it recovered somewhat from 1982-2000 and since then has not peaked. Nearly all studies conclude this. But the battle about the data will rage on – in many ways that is what proper science is about: testing theory against facts; testing the quality of stats and the method of statistical analysis; and showing bias if it is there. Yes, you can interpret the data on the US economy and wages differently from Rasmus and reach somewhat different conclusions. But at least Rasmus’ recent analyses are a counterweight to the rosy picture painted by the mainstream – and generally look more convincing to me. So, still no sign of that promised “Next recession” then, despite all of the headwinds of Trump’s global trade war, Brexit, and continued large scale austerity measures in the UK and the world’s largest economy in the EU. Just an important observation: the USA doesn’t have a true annualised quarterly rate (that’s why the term is between “” in the article) as most of the world has; instead, it takes the pure quarterly rate (Qx in relation to Qx-1) and apply a “normalizer” to it, which is not ideal. True, but those “emerging markets” who adopt classical neoliberalism are in a de facto “Dollar Zone”, because they don’t have means of investment of their own (because they privatized everything) and the preferable source of investment they use is short-term sovereign bonds denominated in dollars. And that’s not even taking into consideration the IMF “takeovers” of their domestic policies. So, in practice, they use the American dollar for investment. Erdogan will learn the hard way Turkey is not Russia. Honestly I’m baffled by statements like that. To me it implies that the Fed can control the economy via interest rate manipulations and that If the Fed does not hike interest rates then the risk of recessions is mitigated. Wouldn’t that then question the cyclicality of capitalism? If the Fed is wrong …rising costs… could lead… to a new downturn? What if the Fed is right? I must admit I’m confused. If the Fed is right then does that imply that rising interest rates does not and has not imposed a risk? How do interest rate manipulations influence/impact/control cyclicality? Perhaps the issue is my comprehension or expectations but if you could clarify that would be great. As an avid reader of your site I would like to see articles that forecast economic upturns as well as downturns. We have been witnessing an upturn lately albeit short term due to, to quote from this article, “one-off factors that will soon turn into their opposites”. Cameron – these are important questions. 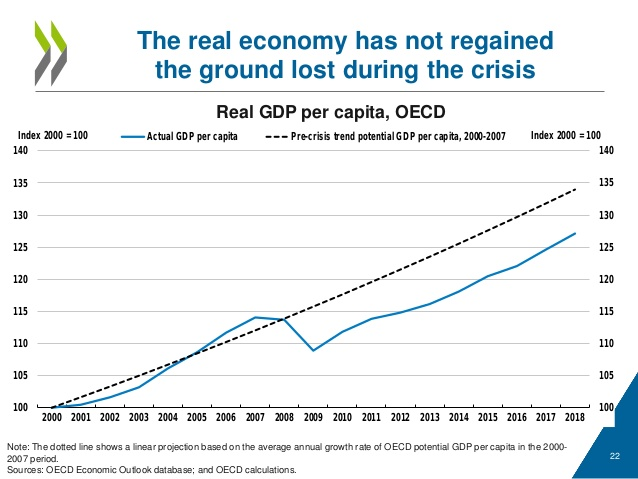 I think I start from the view that central banks cannot control the ‘real’ economy. And they cannot control the demand for money or credit required by the capitalist sector. But they can set the price of interest rates (or at least the floor price) with their policy rates. Profitability decides investment but if borrowing for investment is required (and it is usually is – retained earnings and equity capital may not be enough), then the cost of borrowing becomes relevant. 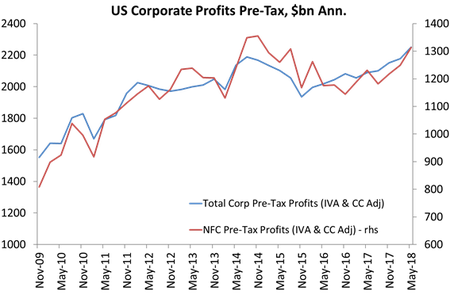 If profitability is high and rising, then borrowing costs are less important and vice versa. Despite the revision, the data continues to show profits fell from 2014 which impacted investment and this together with Chinese tightening slowed the world economy at the close of 2015. In fact, the FED missed the opportunity to tighten prior to 2014 and its tightening in 2015 was immaterial when looking at overdraft and mortgage rates. It was these low rates and China taking its foot off the brake that let the world economy off the hook.